I’m very glad to report that there was no unexpected disaster (like the weather setting in, or a flat tire) that stopped us from achieving our goal. 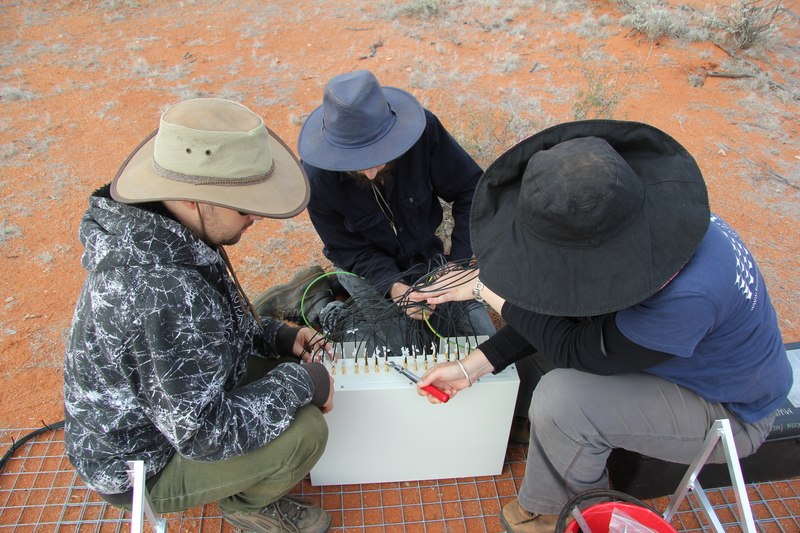 We finished the beamformers and now the MWA is ready to be plugged in to its receivers and then science commissioning to start! Phew, what a week we’ve had. Working on the last beamformer, great feeling. Photo Tom Booler. The proud team after completing the last beamformer. Sammy even has his ‘victory torque wrench’ in his hand (the tool we use to tighten the connectors up to the exact right tightness). Look at those clouds! Blue skies all week, then the last day threatened to rain us out again, but the weather held. Photo Tom Booler. 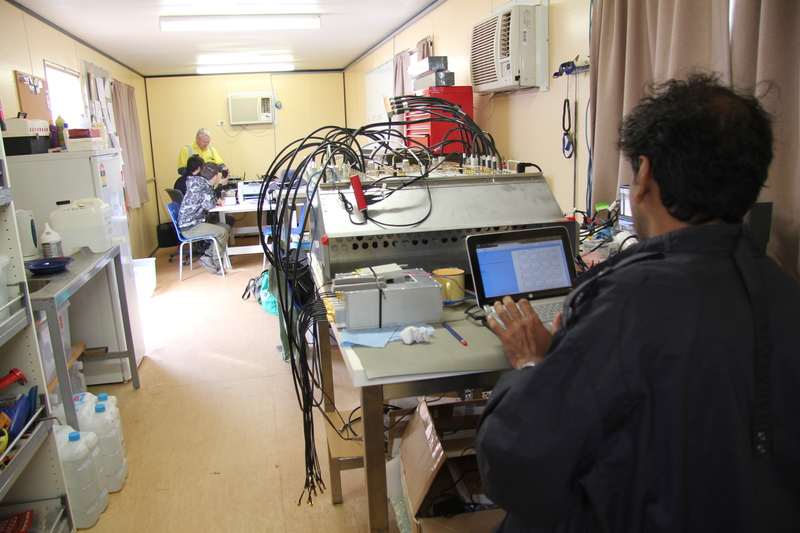 Prabu getting another receiver ready with Dave, Sammy and Luke in the background shining lasers through optical fibre. Yep, we get to do lots of fun things! 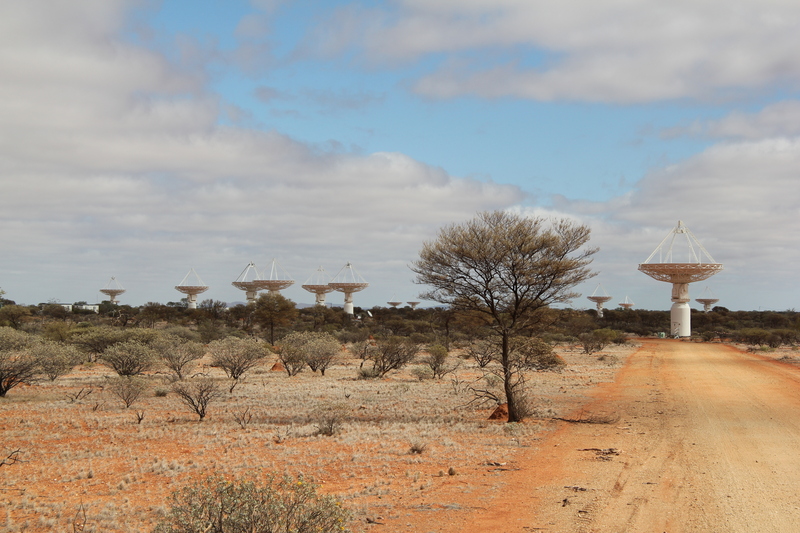 On our way out of site for the trip to Geraldton Tom stopped by ASKAP so we could have a peek at their awesome progress. We’d been ‘showing off’ over the radio with our progress all week by calling in every tile we’d finished to base (mostly so they knew where we were at), so it was good to see the other side of the fence. A big dish next to a little one! 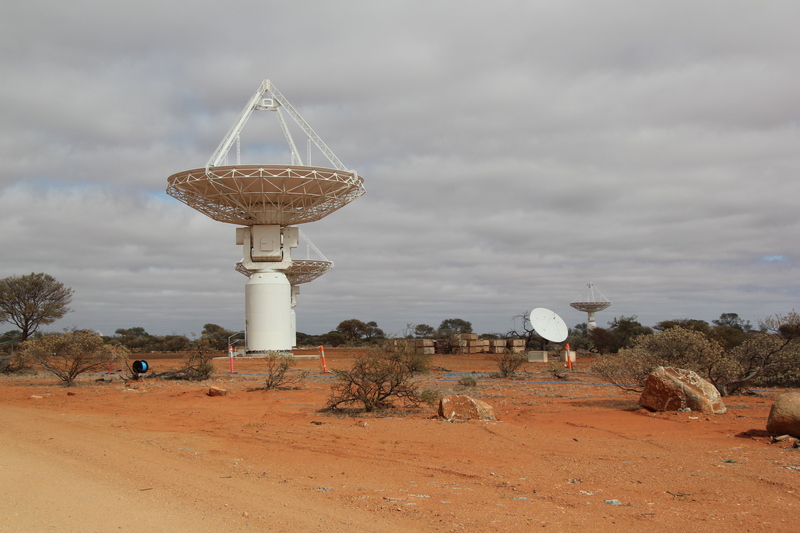 I’m not exactly sure what the little dish is for, but it’s a safe bet that it’s collecting a signal from a satellite. 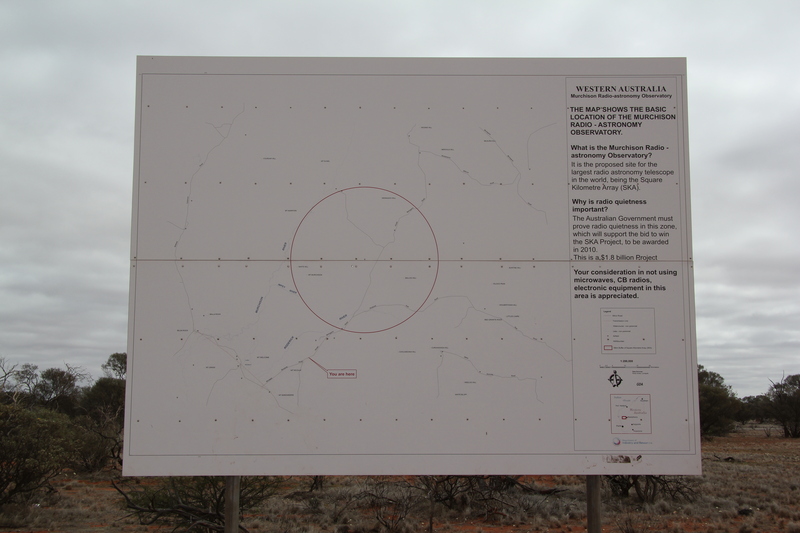 As we headed towards Geraldton for our flight home we passed by the MRO information sign, asking travelers to help keep it radio quiet. It needs an update now we know some of the SKA is coming to WA! After our exciting morning (which featured ‘celebration cake’ after working on the last two beamformers) we took the trip back to Geraldton with Tom, who dropped us at the airport. On our way through town we ran into David Pollock from Wooleen with two of his temporary staff members, Amy and Maxi, who were also getting dropped off. Amy was even on the same flight as us! 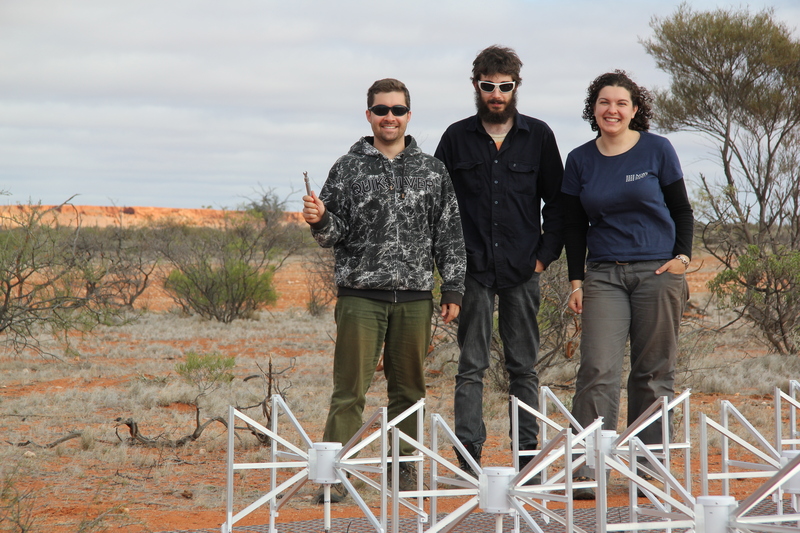 It was great to run into them and catch up a little – Wooleen now has its own MWA tile made from spare parts and prototypes. Tourist attraction for sure! Now we’re all back in Perth nursing the sore spots you get when finger tightening over 2,000 cables and screwing in over 2,000 screws in four days. It’s another bittersweet feeling to have left the Murchison and hopefully we’ll get to go back again some time in the (not too distant) future. The first round of science commissioning starts in the next few weeks, so I’m going to try get one of the scientists to give us a guest blog or two, but for now see you later – I’m off to bed for some well earned rest. Love the blog. Food looks pretty good too!